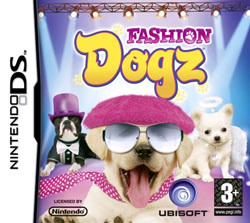 Fashion Dogz, also known in the US as Petz: Dogz Fashion, is a game for the Nintendo DS and is about looking after a virtual puppy, which you can also dress up in hats, shoes, glasses and other accessories. As in other Petz games, your main goal is to care for your puppy. You can choose from eight breeds of dog, and you must feed it, give it attention, and teach it commands. This game has no 'time', and so days only last until you decide to end them or your puppy gets worn out. There are also competitions which you can enter, which judge for sense of fashion. By using hats, glasses, shoes, trousers, skirts and many other clothing items, you can dress up your puppy in a good style and get top marks! There is also judging for tricks and how high your puppy's intelligence and affection metres are. There is a vast selection of minigames, which can be unlocked by winning competitions. They include ping pong, basketball, races, tug-o-war and lots more! But playing minigames decreases your puppy's Vigor, which means if you play minigames all day long it will have no energy left for training. This page was last edited on 4 June 2009, at 19:08.